Charlotte's Web, CLUE, and Side Show the Musical: Get ready for an amazing year! Buy tickets for Side Show now! The Northville High School Drama Club includes a close knit group of students working both on stage and behind the scenes to produce three great shows every year - a fall musical, winter student-run production and spring musical. The stage parents are meeting soon! All meetings take place in the Forum at Northville High School. The 2017-2018 season was a massive success! 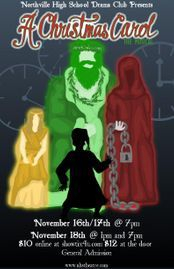 Our fall musical was A Christmas Carol. 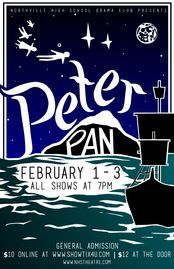 Our student-run play was Peter Pan, directed by Emily Hanlon. Our spring musical was Bullets Over Broadway. In addition, we created a haunted house called Legends of Devils Forest. Be sure to join us in the audience! This website is owned by the NHS Stage Parents.